Scrapes are popping up all over the white-tail’s range and that will continue for the next month. If you have ever been on social media, you may have seen someone “check-in” somewhere. To me, a buck making a scrape is the animal’s way of “checking in” to that location. They use their interdigital gland, tarsal gland, and forehead gland to leave their scent both on the ground, as well as the licking branch above the scrape. Just like in the human world where one restaurant might be visited more often by people, some scrapes are bigger than others. The scrapes in prime habitat are visited more often by deer and are referred to as “community scrapes”. The scrapes in more marginal habitat are referred to as “satellite scrapes”. The frequency that a buck visits a scrape is highly variable and dependent on the buck’s home-range size, age, dominance, and even his personality. The closer to the middle of his home range, the more a scrape will be visited by that buck. When I look at trail cam pictures from scrapes, I am simply using that data point as a who/where/when instance in time. I’m not hanging a stand near a scrape, just because I had a daylight picture at that particular scrape. 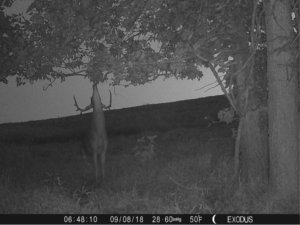 For instance, one buck I had on a trail cam was visiting several scrapes near the edge of a standing corn field last year; I had him on camera in daylight multiple times, but never in the same scrape at the same time on a consistent basis. The intel I gathered from him was that he was nomadic, and had a rather large home core area. My suspicions were confirmed when my neighbor sent me a harvest picture from the buck nearly a mile from where I had him on camera a day earlier. Moving cameras around where you think a mature buck is living will help pinpoint his core area and help you find places where you can ambush him. What I like to focus on when looking at scrape pictures is where the buck came from and where did he exit to during what time of day. In the case of the buck above, he always entered this scrape from the left where there is a bedding area. He would then work back where he came from, so this scrape was likely near the edge of his core area. If you have a cellular camera running on a scrape, you can use the data collected in real-time to know when to move-in on a particular spot. Even if most of your scrape pictures occur at night, you can still use that info to know where a buck is coming from/going to. I also use scrapes to determine the progress of the rut. 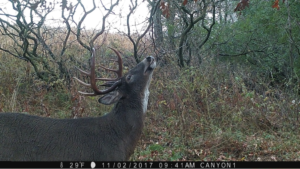 Scrape usage will drastically decline as bucks begin tending does. When the scrapes go cold that means the bucks are spending time with does and you need to shift your focus from hunting field edges to hunting doe bedding areas or rut funnels. This can be a very frustrating portion of the rut, because the deer are no longer chasing does long distances like they were in the previous several weeks. Here is a good reminder from a previous blog on how to pattern doe groups, because in most cases, the place that doe groups live will be where Mr. Big wants to be in early November. Do you have any interesting pictures of bucks using scrapes? Be sure to submit them to our weekly Trail Cam Tuesday prize giveaway on Facebook.